CAN Fund partnered with Ad Army Group to interview some of Canada's established and up-and-coming athletes. CANFUND AND ADARMYGROUP TEAM UP TO GET OUT VERY IMPORTANT MESSAGE, IS YOUR MESSAGE NEXT? 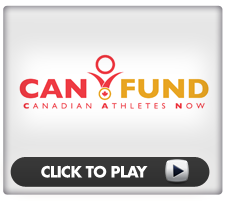 CANFUND is a supportive organization for Canada’s young athletes. Canadian Athletes Now, provides for the training and support of many young athletes who strive to reach the goal that they have set both personally, and in the sports that they love. The organization supports all kinds of athletes, including Olympic Gold Medalist Rosie MacLennan of the London 2012 Summer Olympics. In addition to the financial support, that CANFUND provides to its sponsored athletes, there is a wide variety of other supportive activates that they provide to the athletes. CAN FUND takes time to get to know each athlete that they sponsor and works with them to help those athletes reach the goals they have set and the dreams that they aspire to. CANFUND has a very important job to do for Canada’s athletes, and they have engaged the services of a premier Toronto video production service AdArmyGroup to help them get it done, because they know what it’s like to work with the best. As a top-quality Toronto video production service as well as a boutique advertising agency AdArmyGroup was able effectively to fulfill the needs of the Canadian Athletes Now organization. They were able to provide them with a web video expresses the needs of this fine organization to garner the financial support it needs to continue to support Canada’s future athletes. When CANFUND needed to get their message out, they knew they needed to turn to a Toronto video production service that was not only talented, but preferably associated with a boutique advertising agency that was going to provide a personal service and dedication to their needs. They wanted to create a web video that would help them get the message out to the masses in an effective and memorable way but also within a reasonable budget. They chose to do business with AdArmyGroup because Paul Cookson, and his fellow team members, were able to give them a brief video that accurately conveyed the message they needed to get out in a way that connected with the viewer in a productive way. Working with CANFUND and with RosieMacLennan, AdArmyGroup was able to provide a concise video that is connective and effective while maintain the limits of the budget the organization had. This video is a fine example of what a boutique advertising agency can do for a client. So why should a business or other organizations take advantage of what a Toronto video production service associated with a boutique advertising agency can offer them in terms of web video production? The answer is simple. A boutique advertising agency is able to provide a level of personalized service that a major advertising agency simply cannot offer. The team at AdArmyGroup can provide their clients with everything from basic web video production to full-scale marketing programs that cover a wide range of offerings. If an organization is looking for the best in Toronto video production services, they need not look any further than the AdArmyGroup from their web video projects. If a person, business or organization is looking for a top-quality option for developing an exposure campaign that meets their needs, their time window and their budget, they should call Paul Cookson and talk to him about what AdArmyGroup could do for them. Paul Cookson is one of the driving forces behind the incredible creative work that AdArmyGroup does and the success that they have enjoyed and shared with their clients. Paul has the talent and creativity to give your business or organization the exposure that it needs to accomplish its mission or goals. He is not only an accomplished web designer, but also a top-notch marketing expert. Paul has the skills to take your organization to the next level with everything from logo design to print materials, publicity programs, web design and even top quality web video production. His being a part of AdArmyGroup brings to clients the ability to take advantage of everything that they need to grow and succeed. Paul is more than just a well-known name in Toronto video production, he is also one of the most forward thinking marketing experts in the country. He is committed to bringing the personal attention that a boutique advertising agency can offer to every client that he works with Paul Cookson, and AdArmyGroup have what it takes to provide their clients with everything they need in terms of marketing, especially in the realm of web video production. Being not only one of the most respected and talented Toronto video production services, but also a very client-centered boutique advertising agency. Many organizations have already taken advantage of what AdArmyGroup can offer. Shouldn’t your organization see what they can offer you? You can be sure that your competition already has.